David Ayer has become a divisive director over the last several years. Many believe that his filmography peaked with 2012's End of Watch or his 2014 Ten Little Indians remix Sabotage. His 2016 film Suicide Squad was critically maligned, making many "Worst of' lists for the year. His latest offering Bright stays comfortably within his wheelhouse, presenting yet another law enforcement saga. 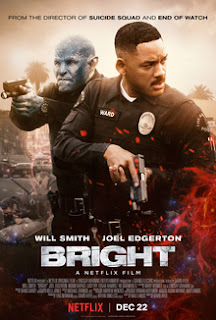 Featuring a solid performance by Joel Edgerton and a host of recycled tropes, Bright ends up rising above its admitted mediocrity with a few inventive action sequences, unexpected levels of violence, and outstanding costuming. In the universe of Bright humans and fantasy races (Elves, orcs, etc.) have lived together since the beginning of time, with orcs being stereotyped as criminals and traitors due to past transgressions. Jakoby (the first orc police officer) and his antagonistic human partner Ward, are thrown into the middle of a magical conspiracy that threatens to destroy the world...again. There's absolutely nothing new about Bright. It features a world that has similarities to the role-playing game Shadowrun and uses the juxtaposition of fantasy species to explore racial discord, but it never goes beyond the most basic ideas. Bad Boys with orcs is a fair descriptor, yet, Joel Edgerton's performance as Jakoby, along with Will Smith's usual flair help to move things along. Jakoby is imperfect, perhaps even cowardly at times. His transition is telegraphed from the start, yet Edgerton's approach endears him to the viewer, even with a considerable amount of makeup. Smith supports in a more vulnerable role. His Ward simply wants to get home to his family and this is an excellent change of pace from the brash characters he is known for. Noomi Rapace and Edgar Ramirez support as elves, and while their performances are forgettable, Kelli Jones' costume design is a highlight. Rapace's villain glides through every one of her scenes using her considerable talents in an attempt to build tension, but the there's simply not enough there. Bright is a shallow story that never gives itself time to breath, especially with respect to the possibilities of the world around it. This is probably the film's biggest flaw. While the story and bulk of the performances are lackluster, the world of Bright is intriguing, begging to be explored, however this is eschewed in favor of the next vicious shootout or maiming. The result is a mixed bag. It is fun at times, but it also has a coldness to it that persists throughout. Roman Vasyanov's cinematography is the strongest element, highlighting an alien Los Angeles with deep blues and vibrant oranges. There are interesting compositions sprinkled throughout, especially in the first act, which features an inventive spin on the reasoning behind the retreaded chase sequence that weaves through the heart of the narrative. This is a theme that is echoed throughout. Every time something fresh is presented, it's sacrificed for exposition and explosions. 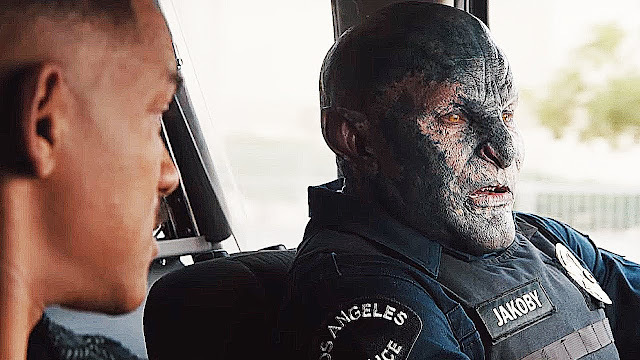 Ultimately, Bright is a fun film that absolutely demands the viewer disconnect themselves from any sense of reason. It's almost antagonistic at times, wallowing in a harshness that has settled into the bowels of the entertainment industry before skyrocketing into borderline slapstick action. If you approach this film as a Netflix blockbuster knock off, filled with every single Ayer trademark possible it will not disappoint. However, looking deeper, there are borderline insulting clichés and a distinct lack of imagination that will undoubtedly turn many viewers off.